Nestled in the northwestern quarter of Oceana County near US-31, the City of Hart is a quaint, quiet community, a perfect place to raise a family and enjoy a good life. Hart residents - it's time to clean out your closets, basements, and garages. 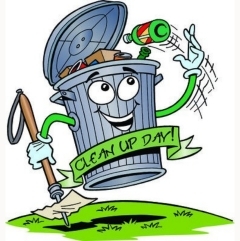 The City will be hosting a clean-up day on Saturday, May 11th. Just place your "treasures" at the curb for pickup the night before. Acceptable Items: We will collect basic household trash, bulky items (furniture, etc.) and limited building material - must be boxed or bundled and no more than four feet in length or 40 pounds. Unacceptable Items: No tires, concrete, bricks, auto parts, tree stumps/limbs, scrap iron/steel, and no hazardous waste - (paint, household cleaners, liquids, gas, oil, medical waste or asbestos). Tires (whole, no rims) can be taken to the Oceana County Road Commission located at 3501 W. Polk Rd., on June 22, 2019, from 9:00 am to 1:00 pm for drop-off. For more information on this service, contact Suzie Knoll at suzie.knoll@macd.org or call 231-861-5600. You must pre-register for this service by June 21, 12:00 pm. Twenty-two miles of smooth new pavement for your ride; that's the William Field Memorial Hart-Montague Trail, now finished and ready for you and your family to enjoy. The City of Hart marks the north end of the trail, providing easy access and plenty of amenities. The trail was once a Grand Rapids to Pentwater railroad line dating back to 1872. From Hart you can head south on the trail toward Shelby, Rothbury, Montague and points in between, making for a fun and memorable day's adventure. Find convenient free parking at our trail access point with refreshments and food nearby. Check the links below for trail information and maps, courtesy of Michigan Trails Magazine and website. The police department is looking for the owner of a lost raft on Hart Lake. It is pictured at left. Please contact the Police Department if you have information. This lovely little bunny was recently left at City Hall. If he is truly yours, please stop by to claim him! UPDATE: This bunny found a home with our Police Department as an aid to soothe troubled children! He is sure to be well loved. Wondering what things wonderful are happening in Hart? Find out on our Parades, Markets and More page. There we have articles and information about upcoming events for everyone. Hart Hydro Disc Golf Course: Ready to Play! The Hart Hydro Disc Golf Course is open year-round! Join the fun and check out the all-new 18-pin course. Download the course map at the link below. Be prepared to get wet as you will be playing right next to the dam and Hart Lake! Address: 3640 W. Harrison Street, near Hart Dam, off 72nd Avenue.